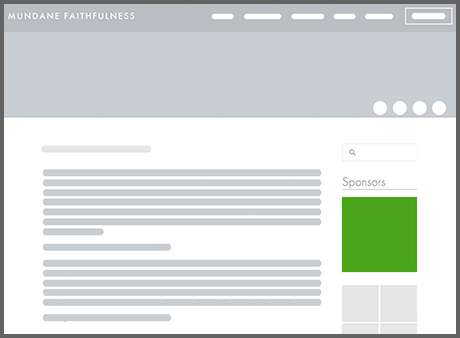 Mundane Faithfulness is creating a community of gracemongers through our blog and podcast. Mundane Faithfulness (mundanefaithfulness.com) is a continuation of the online community started by author and speaker Kara Tippetts, whose message of looking for grace in the mundane of everyday life has brought hope to thousands of people. Since Kara's death in March, 2015, the Mundane Faithfulness team has been reposting her original blog posts, as she requested, and moving forward to build and strengthen community among those of us who want to explore what it means to engage hard things, lean in to Jesus, and choose joy every day. Our podcast, which can be found on iTunes, gives us the opportunity to connect in a more intimate way. The Mundane Faithfulness Community has become a family of gracemongers learning how to encourage each other to choose joy, fight for grace, and walk each other Home with hope in Jesus. Opening our sponsorship to our friends provides a way for you to help and support Mundane Faithfulness in a very tangible way. 90x90 Ad in the sidebar of the entire site. 191x191 Ad in the sidebar of the entire site. 700x100 Ad appearing at the bottom of all blog posts, above the comments area.